What is a Stencil Printer? The first step in a paste, place, reflow assembly operation is the Stencil Printer, which can be manual, semi-automatic, or automatic. This machine dispenses solder paste, using a squeegee, forced over the openings in a stencil onto a printed circuit board. The first question to answer is: What production range are you dealing with? This will help you to decide what level of automation you’ll need. Over 500 boards/day is in the fully-automatic range, and can cost $30,000 or more depending on the bells and whistles that come with it. Check out DDM Novastar's wide range of Stencil Printer Machines. Here, speed is typically not an issue. Fine pitch and accuracy are the most critical factors. Accuracy is determined by how securely aligned the circuitboard is in the machine. There are 4 dimensions to consider for the control method: X, Y, Z and Θ. 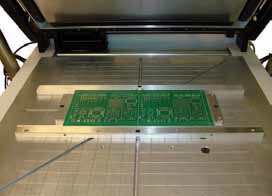 Once the paste is applied, the stencil is lifted off the circuit board, either vertically, or pivoted. There is no practical difference in either of the two lift methods. In a moderately high volume environment, several of the functions can be automated to some extent, making the process more efficient, more repeatable, and allowing a higher yield at lower cost. Here, everything is managed without operator intervention. 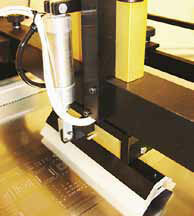 Systems may include automatic board loading/unloading and auto fiducial alignment for X, Y, Z and Θ positioning. Again, you get what you pay for. If you’re running 2,000 boards/day, more automation may provide significant dividends in terms of quality yield, reduced labor costs, and more control over your process. If you’re spending the kind of money a fully automatic system commands, you will need to perform some serious due diligence on special capabilities that can’t be covered in a short article. Regardless of the volume, you’re looking for the best accuracy and repeatability you can get, so once fixturing is set up, you don’t want to waste time recalibrating. Accuracy and repeatability are directly related to fine pitch capability, and pitch accuracy is directly related to machine stability. For this reason, construction of the holding plates is critical. Machines constructed with sheet metal are not nearly as stable as those made using a machine ground holding plate with welded frames. This assures that nothing moves from one board to the next so you can expect repeatable accuracy from board to board. Another factor affecting print quality is the squeegee type. Squeegee blades are made from several materials, and come in a variety of sizes. Blade types are commonly urethane, metal (most popular), and plastic. Metal squeegee blades typically enable a more controlled print height across the board, and work well with a mix of component sizes. One of the most important aspects of this evaluation (for any SMT machine, frankly) will be support, and the best way to learn how a company treats its customers is by word of mouth. Talk to several customers to find out how happy they are with the machine, the seller, and the support they provide. Where is the manufacturing plant? Can they help troubleshoot software or alignment issues over the phone? Do they offer field service? Do they have spare parts in stock for immediate shipment? Remember to ask your supplier about their older machines in the field, and if down the road, spare parts are available, and about their capability to customize a spare part if the machine becomes obsolescent. Ask what the expected life-cycle of the product is. The industry standard is 7 years. Remember, there is a difference between a true manufacturer and an equipment supplier or distributor. Do you need a method to print both sides of the board? Check to see that the model you’re considering offers a double-sided nesting fixture, or vacuum fixture to hold down flexible circuits. Every stencil manufacturer makes different size frames. 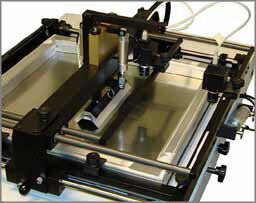 The stencil printer you buy should be able to accommodate various size mounting frames and/or tubular frames. The manufacturer should also be able to provide adapters for frameless stencils. Don’t overlook electrical requirements. Be sure the machine you buy will plug-and-play in your environment without new wiring or plan on an adapter/transformer. Remember: The application of solder paste is the start of your process. It must be right because the rest of the process can’t make up for improper solder placement. Click here to contact DDM Novastar for information on Stencil Printer or other machines. Download the PDF: "Selecting a stencil printer"